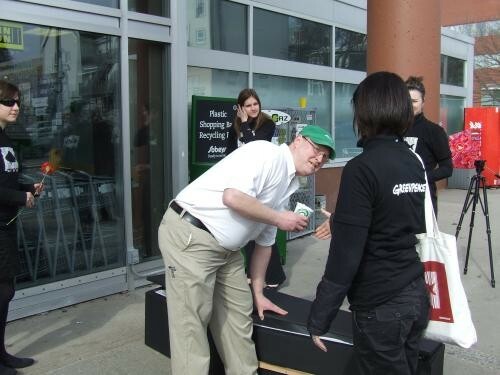 A small group of black-clad Greenpeace campaigners startled grocery shoppers in downtown Halifax today when they drove a hearse to the doors of the Queen Street Sobeys and unloaded a coffin containing the head of an Atlantic cod. The Greenpeace “mourners” carried red roses and silently handed out an "obituary" noting that “Atlantic Cod died on July 2, 2028 after suffering a long fight with overfishing." The notice adds: "Atlantic Cod was preceded in death by the Atlantic walrus and is survived by the jellyfish." Within minutes, Sobeys managers ordered the protesters to leave. The Greenpeace campaigners retreated to the public sidewalk and Halifax police arrived to make sure they stayed off Sobeys property. 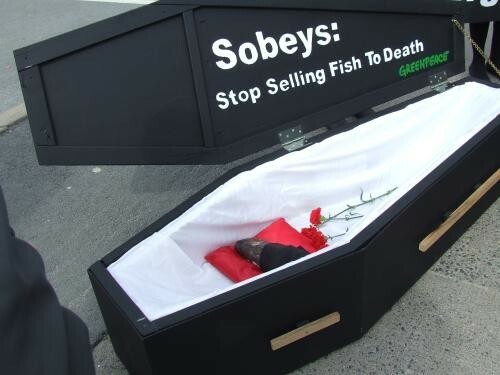 King said that as a company based in the Maritimes, it’s unacceptable that Sobeys continues to sell fish that are in danger of extinction. 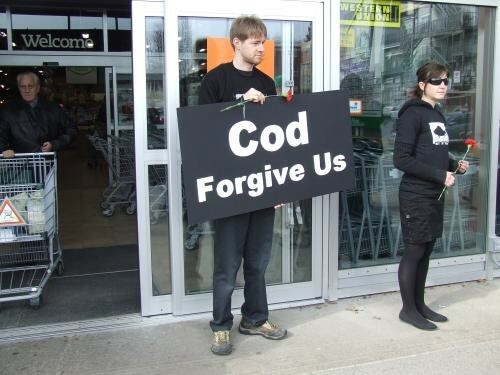 A Greenpeace fact sheet says all eight of Canada’s largest retail chains sell Atlantic cod. King said that after receiving a failing grade from Greenpeace last year, Sobeys promised to develop a sustainable seafood policy, but has since abandoned its plans. She added that the company also sells other endangered species including bluefin tuna.